We were thrilled to win the Jobs Growth Award at the recent Institute for Sustainable Design (ISD) iSustain Awards. ISD encourages innovation through design and improvement, and was judged by Head of Knowledge Transfer and Commercialisation at the Welsh Government. 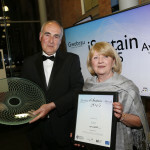 The award was presented by The University of Wales Trinity St. David for our recent growth and job creation. We have worked closely with the design centre and partner organisations, and over a three year period have created a total of 28 jobs. The award itself was presented at a gala dinner held in what was formerly Swansea University’s Library, but is now the reading room of The University of Wales Trinity St. David’s newly refurbished Alex Design Exchange campus. It is brilliant to have this achievement recognised by the ISD; we look forward to being able to offer further employment opportunities here in Wales in the future.